Summertime is a great time to host a party, but in order to show your guests a good time you have to beat the heat. No one wants to be excessively hot and sweaty or eaten by bugs at a summer party. In this article, I will provide you with tips and tricks on how beat the heat at any summer party this year. The first tip to beating the heat this summer is of course quality ventilation. Those tower fans are great inside your bedroom, but at a party they are just not quite enough. Talk to your rental dealer about renting misting systems to keep your guest cool in the heat of the sun. Water misting systems come in many sizes and options to choose from and can make a big difference in your guests’ experience. Everyone loves a fresh splash of cool water on his or her face when the sun is beating down. Another great option for keeping an event cool is outdoor cooling units. Outdoor cooling units function like air conditioners, but are more powerful. They are often used in industrial garages, but smaller versions can be rented to keep things cool. If you are looking for a more eco-friendly cooling option, I recommend using an evaporative cooling system. Evaporative coolers are similar to air conditioners except they are quieter, have lower emissions, they’re energy efficient, and easy to install. Evaporative coolers are ideal for an open outdoor space that may not have any enclosures and are best suited for a hot, dry day in the sun. They also work really well for keeping moisture in the air so things don’t get too dry. If you prefer not to go through the hassle of setting up cooling units or maybe your guests are easy going and young, go with the classic big fan. Fans have definitely come a long way and can still do the trick when the right size is used in the right space. Consult with your rental dealer about what model and size would work best for your party. Fans will also help repel bugs away from guest as well. The last thing to consider to beating the heat this summer is utilizing a tent. Tents are great because they come in all sizes and styles. They are also customizable and can provide both shade and protection from rainy weather. Ideally, I recommend to having both a tent and some sort of cooling system in place just in case it rains and humidity rises. The last thing you want is everyone under one tent and it becomes stuffy because the area isn’t cool enough. 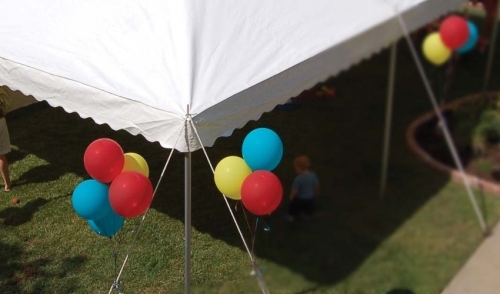 This summer is prime rental tent season, so be sure to call your rental dealer and book one well in advance so that your guests have somewhere to go to where they can retreat away from the sun. Additionally, you can add sidewalls and other attachments to further reduce the heat. Don’t let your guests sweat through their nice clothes and feel uncomfortable when there are ways of keeping them cool without breaking the bank. Shield your guests from a bad experience by following these tips and your next summer party will be highlight of the season.